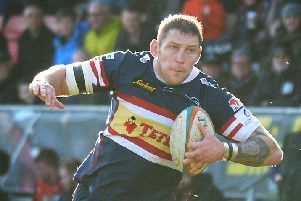 Second-rower Tyler Hotson is more familiar with London Scottish's ground than most of his Doncaster Knights’ team-mates. Considered to be unlucky to miss out on a place in Canada's World Cup squad last year, Hotson lists the Exiles among his former clubs. One reason why the 30-year-old, who missed out on a place in the team which beat Cornish Pirates at the Mennaye Field last weekend, hopes to be back in action on Saturday. Hotson, who has found it hard to stake a claim for a regular starting spot this season due to form of Canadian team-mate Jon Phelan and Matt Challinor, celebrated his return to the Athletic Ground last season when scoring the only Doncaster try in the 13-13 draw last March. “We’ve always had really close games against London Scottish since I’ve been here and they are always a tough team to beat down there but we always put in a performance against them and hopefully we can pick up another win on Saturday,” said Hotson. “They beat us at Castle Park last season and they also gave us a good game at home this season. “I think people are probably a bit surprised where they are in the table just now considering they finished in the top four last season. “But they’ve had a lot of injuries and that has affected them, though they have been getting players back of late and that has resulted in better results. “They rely heavily on their pack and have a good driving maul, but they’ve also got some good backs and in full-back Peter Lydon they have a very classy kicker. “So we’ll have to be on our game and get our set-piece right and exploit any weaknesses on the day and be generally switched on. “One thing in our favour is that we’ve shown that can compete in any conditions.